A surviving section of the original 1850’s diggings. This is a genuine alluvial gold landscape. As more and more newcomers pegged their claims, they followed the deposits of gold up the eroded flats and valleys feeding the creek. It soon dawned on the crowd that gold washed into the river flats came from the surrounding rises. In March of 1852, White Hill was the scene of a rush within a rush, and a month later the adjacent rise known as Red Hill was swarming with hopefuls, some lying stretched out on the ground to secure their eight foot by eight foot claim (about two metres by two metres). Today, the Forest Creek Gold Diggings occupies the remains of White Hill and Red Hill. There have been nearly 150 years of continuous mining here, and a remarkable range of techniques has been used to extract the alluvial (river deposited) gold. All of these techniques were versions of the panning process, whereby clay and gravel are washed away from the heavier gold, and all have left their traces. Today, the Forest Creek Gold Mine occupies the remains of White Hill and Red Hill. There have been nearly 150 years of continuous mining here, and a remarkable range of techniques has been used to extract the alluvial (river deposited) gold. All of these techniques were versions of the panning process, whereby clay and gravel are washed away from the heavier gold, and all have left their traces. At first, miners of the 1850s dug shafts through the layers of the ancient riverbed, and carried gravel and clay to the creek below to be washed in pans or wooden 'cradles'. Sometimes miners digging a shaft would be tricked by a layer of sediment `as hard as the pyramids', and abandon their shaft before reaching richer deposits below. A number of 1850s shafts remain on White Hill today. Later mining methods included puddling, a process of washing and working clay to release fine particles of gold. This could either be done by hand in a small trough, or with the help of a horse working a large circular puddling trough. In times of abundant water, surfacing was practised. It was a process of flooding the surface of a hill to remove the gold-bearing topsoil, and directing the flow through a series of barriers, known as a ground sluice, to collect the gold. As technology developed, the hill itself was sluiced. Powerful pumps were employed to direct water with great force at the base of the hill. The resulting slurry was collected and passed through a series of traps to separate the gold. 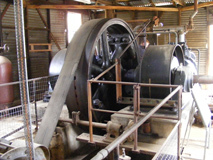 The sluicing installation here boasts a remarkable 200 horsepower Ruston and Hornsby engine. Installed in the 1930s, it chiefly worked after the war from 1948-54. It could pump 18 tonnes of water a minute at high pressure against the cliff-face. The jet was strong enough to cut a person in two, and the roar could be heard 2-3 miles away. At night sparks would fly as quartz rocks collided in the air. • Walk around the .5km track and read the story of gold on the nine informative boards placed around the track. 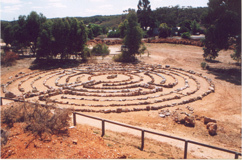 • Play in the Geo-maze, a low maze constructed from local rocks depicting the geological history of the area. 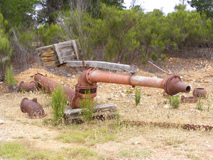 • Examine the old Ruston & Hornsby engine used to deliver water to the sluicing nozzles. • Have a picnic beside the old dam. 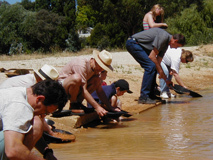 • Purchase a gold panning kit at the Castlemaine Market Centre and return to pan for gold. • Solve the mystery of ‘Whatever Happened to Dundee Jock’.